Signature Arts, Inc.: Beware!!!! More Fake Williams and Mantles Hit the Internet! Beware!!!! More Fake Williams and Mantles Hit the Internet! I am seeing waves of bogus Ted Williams, Joe DiMaggio, Sandy Koufax and Mickey Mantle autographs on pictures and baseballs. On August 2 I saw a "signed" photo of Mays, Mantle, Dimaggio and Snider (with a COA) sell for $97 on ebay!! If it was legit it would sell for $700 or more. Don't buy those horrible items, you cannot get bargains in autographs. 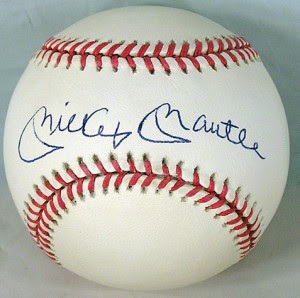 You can only buy good items at realistic prices or junk items at ridiculously low prices but then again, if all it costs a crook is $2 for a photo or $6 for a ball and $1 for his own sharpie, then he can sell Mantle and Williams for less than $50 and still make a huge profit. Lots of guys are getting rich off the unknowing buyer. Don't let them get rich off you! These items come with COA's also. Be careful out there! ps. There is an e mail in circulation on the internet which actually names the man who is distributing many (or maybe even all) of these forgeries. Perhaps it is time for a new Operation Bullpen! !